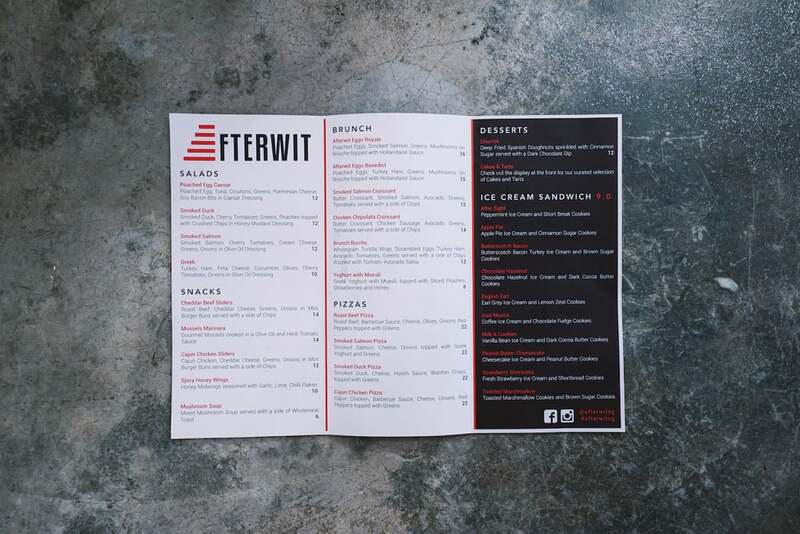 Afterwit is a term for the should-have thoughts that comes after a complex scenario, like a quarrel. This cafe, by the same guys from indie Working Title, is a space that inspires afterwit before the complex moment happens. 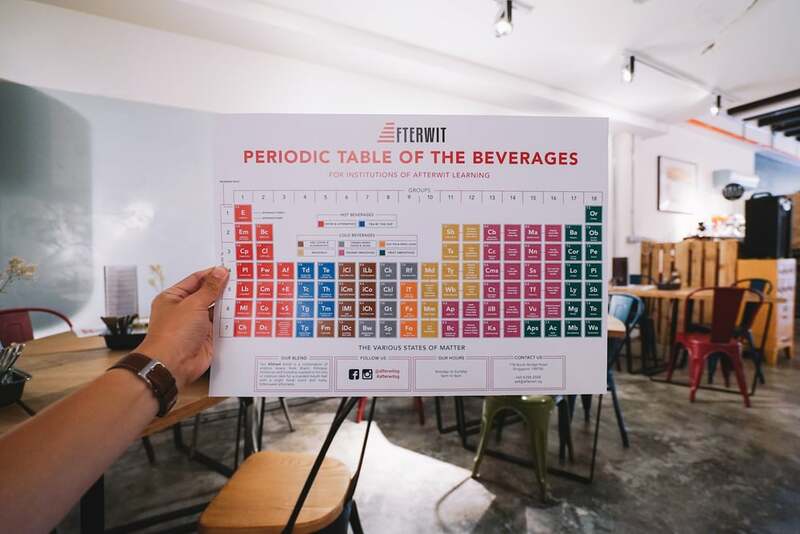 To complement that, they have a periodic table worth of drinks to fuel the inspirations. It is a compact space with really kickass wall arts. With mainly ambient lights and spot lights, it can be quite dim but sufficient for working on laptop. Out of the whole list of drinks, we wanted to try the bolder options, like Sabai Sabai, a Thai milk tea shake. The description was very alluring, and it was indeed quite an exciting taste for the palate. Unfortunately it didn’t sustain till the end of the drink, something about it was just not right. Some of the drinks were just replay of the usual and nothing to rave about. At least the coffee here is reliable, taste was mild and balanced. The Chicken Chipolata Croissant was a good bet, crispy, soft and buttery, our taste buds approved. The soft chipolata sausage was a complement. We also had the Brunch Burrito. The skin wrap of this burrito had a special taste – like a book, don’t ask us how, but it did, and we are not sure if people would appreciate this taste. Thankfully the things in there were quite tasty. We might have too many Eggs Benedict in our lifetime, but it didn’t hurt to get one more. The Brioche was the highlight, soft and crispy. However we noted the chosen ham was rather tasteless and the eggs were slightly undercooked. Probably a ham that is saltier will work better and the consistency for the eggs had to be better supervised. The Spicy Honey Wings turned out to be a simple fare, might not be value for money to some but the taste was fine. I especially loved the Mussels Marinara for its tomato sauce, I was literally drinking out if the bowl. However the mussels that day were not the freshest and relied heavily on the sauce to mask the fishy taste. Just weeks into its operations, we were lucky to have an early preview of their potential. Some hits and misses at their start but the food should be fine tuned in time to come. If you are in the area of Kampong Glam and is tired of the same few cafe hunts, try this for a change. Thank you Afterwit for hosting us.